The McCoury family legacy is one of the richest in bluegrass. Father Del McCoury was a crucial member of Bill Monroe’s Bluegrass Boys and achieved legendary status with his souring lead vocals on signature Monroe songs and originals. His band is a family band, and has been for a while. Sons Ronnie and Robbie were raised and bread during a pinnacle renaissance of progressive country and bluegrass, but the McCoury boys continued the family musical’s tradition of playing like the founders did. Five-String Banjo man Robbie has a fascinating knack for emulating the dynamic strength of the Earl Scruggs signature three-finger style, while developing his own individual musical identity. That unique identity is clear when examining the songs he chooses to lead live in concert. 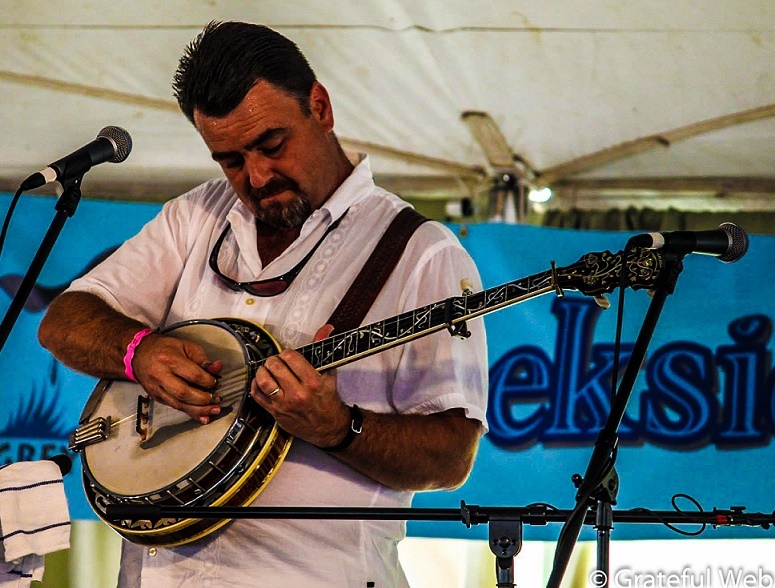 His fiery solos and effortless dexterity make him a crucial player in the contemporary bluegrass community. Surprisingly, Robbie who has played professionally for over twenty-five years is finally releasing his first solo album. The Five String Flame Thrower is simultaneously a collaboration with and tribute to his mentors. The impressive track list dives heavily into the Scruggs catalogue in addition to a variety of other fundamental bluegrass. Guests on each track reflect Robbie’s relationship with the generations before him and his capability to interpret and recover classic gems. Even the albums closing track “Feudin’ Banjos,” an original, feels like a standard. Though tunes like “Charlotte Breakdown” or “Sugar Creek” effectively showcase Robbie’s capabilities as a lead banjo, the spirit his playing is collaborative. And his proud family joins on a few tracks, most memorably on “I’ve Lost You” where Robbie confidently accompanies his father’s steady rhythm guitar. Brother Ronnie and Del McCoury Band fiddle player Jason Carter add their supplementary textures for some fine moments. It’s just the sort of familial support that continues to build the McCoury bluegrass tradition. Scruggs “Foggy Mountain Chimes” has never been attended to with such urgency of accuracy. “Blackjack” by contrast is a speed demon with a brilliant fiddle accompaniment from the Bobby Hicks, another Bill Monroe Band alum. What’s most endearing about the new album is the blend of cornerstone instrumentals with certain quality canonical selections sprinkled in. It’s really a songbook from an array of important influences that stack together real nicely next to one and other. The Previously unrecorded “Jericho” expands the albums sound with a laid back country-western flavor. The rolling thunder of “Caracas” unravels with the tag-team solos from the family band. Naturally Del McCoury Band and Travelin McCourys devotees with have no trouble digesting this appetizing selection of crucial country. The Five String Flame Thrower is a natural reminder of Robbie’s continued significance to the bluegrass and folk community, never boasting his abilities, but almost always rejuvenating whatever tune he rolls his banjo towards. The new album is set for release on August 19th online and in stores. It’s a worthwhile addition to modern bluegrass, one that’s a long time coming.